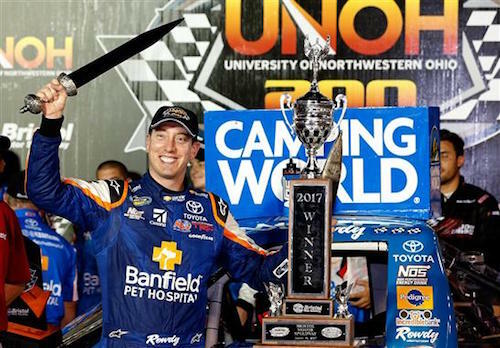 Kyle Busch celebrates in victory lane at Bristol Motor Speedway after winning the UNOH 200 on Aug. 16, 2017 (photo courtesy of Getty Images for NASCAR). After a two-hour rain delay, Kyle Busch kicked off a triple-header NASCAR weekend with a win Wednesday night at Bristol (Ten.) Motor Speedway in the UNOH 200 NASCAR Camping World Truck Series. It was Busch’s fifth Truck Series win at Bristol. The win was the first for crew chief Cody Glick. “Right off the truck, it was pretty good,” Glick said. “We made a lot of small changes through practice and just found a little more speed, but all in all, it was pretty good right off the truck. I was pleased. After starting on the pole, Busch was up front for about half of the race that was extended from 200 to 203 laps by a late-race caution, despite a speeding penalty just past the halfway point of the race. Busch and second-place finisher Matt Crafton combined to lead all but four laps of the race, with Austin Cindric and Ben Rhodes combining to lead the other four under caution. Busch also won both 55-lap stages of the race, running up front for the entire first stage before Cindric and Chase Briscoe opted to stay out during the yellow that separated the first two stages of the race. When the race returned to green, Crafton took the lead and ran up front for 40 laps before Busch retook the top spot with about six laps remaining in the second stage. Busch got off pit road first during the yellow between the second and third stages, anticipating a restart up front for the final stage, but a speeding penalty put him in the back and Crafton up front for the restart at the beginning of the final 90-lap stage of the race. Busch got up to third with 44 laps remaining and about 10 laps later, he took his final lead of the race. The yellow flag waved three times for on-track incident, the first two of those coming in the first stage. After the second stage ran caution-free, the final caution came on lap 195 for an incident involving Austin Wayne Self and Justin Haley, sending the race into overtime. John Hunter Nemechek got by Johnny Sauter on the overtime restart to finish third. Grant Enfinger and Rhodes rounded out the top-five, while Sauter fell back to sixth by the finish. Finishing seventh through 10th were Christopher Bell, Parker Kligerman, Cindric and Brandon Jones.